Home Read Booklets The Beast of Revelation: Myth, Metaphor or Soon-Coming Reality? Today's newspapers record a state of affairs that would have been absolutely unthinkable to an observer in 1945, at the end of World War II. Then, the Rome-Berlin Axis lay smashed, and American and British forces stood at the pinnacle of victory. Today Britain has been shorn of her empire and America is morally and culturally bankrupt. Europe is busily uniting under the aegis of a powerful German-dominated European Union. In the decades following World War II, America and Britain invested billions of dollars in intelligence and counterintelligence operations. Yet the most astounding geopolitical events of the post-World War II era—resulting in the collapse of the "Iron Curtain" and the emergence of a powerful reunified Germany—caught these governments completely by surprise. "Like a great many Americans I have been watching the current political situation in East Germany with interest. While many have expressed surprise at the recent events and at East German cries for reunification of East and West Germany, I have to admit I haven't been too surprised by these events. The reason I haven't been particularly surprised is that for years I have occasionally read the publications of… the late Herbert W. Armstrong… Armstrong predicted that the Berlin Wall would some day come down and the two German states would once again reunite into a powerful nation." As far back as the April 1952 Good News, Herbert W. Armstrong had written that East Germany would be returned to West Germany and that Russia "will be forced to relinquish her control over Hungary, Czechoslovakia and parts of Austria" (p. 16). In 1956, following Russia's invasion of Hungary, when it seemed that the "Iron Curtain" had inexorably fallen on the nations of eastern Europe, Mr. Armstrong wrote: "The way is being prepared for a colossal third force in world politics—a European Federation of Nations more powerful than either Russia or the United States!… We have shown years in advance what would happen to Russia's ill-fated Empire in Eastern Europe" (Plain Truth, December 1956, p. 3). How could he possibly have known? In this booklet you will find out! Not since the days of the Tower of Babel have humanity's efforts been more intertwined and interconnected. Today we commonly talk of how the world has been transformed into a "global village." Jet planes, instantaneous telecommunication and integrated world economies have changed our world. From finance to manufacturing, multinational corporations and conglomerates now dominate virtually every field. People everywhere are linked by the Internet and satellite television transmissions. Yet paradoxically, nations are increasingly subdividing and fragmenting along old ethnic and religious lines. Where is it all leading? While the world economy becomes ever more interconnected, ancient ethnic rivalries and hatreds are being renewed afresh. Leaders in finance and government cite these continually increasing pressures to illustrate the need for a viable alternative to the present, unsteady system of independent nation-states. It is apparent that unless human emotions can be channeled differently, they will fracture the whole global economic structure. Humanity is seeking an identity that reaches beyond current divisions and rivalries. Internationalists have a great desire to supplant the independent nation-state with something greater. Still, they have been unable to devise a solution that would claim the loyalty and stir the emotions of the average man in the street. People do not develop intense emotional loyalty to faceless bureaucrats or to goals of maximizing corporate profits. Where is this looming crisis—fragmentation in an age of globalism—really taking us? There is only one source where you can find the answer! The Creator God is the One who has declared the end from the beginning (Isaiah 46:10), and He lays it out for us in His book, the Bible. The most complete outline of future events is found in that last and most mysterious of Bible books, the book of Revelation. In it we read of a mysterious Beast which is described with heads and horns, bringing a dreadful mark. This creature is described as dominating the whole world and wielding awesome power and control. But what does this all mean? Can you really understand it anyway? Though much of Revelation is in symbolic language, the Bible actually interprets its own symbols! Read on to understand the clear message of the prophecies of your Bible regarding the Beast of Revelation. These prophetic words will have more effect on your world and your own future than you can possibly imagine. All eyes turned as an elderly man walked erectly into the brightly lit and lavishly decorated banquet room. Wine-induced laughter and loud banter—which had filled the room a mere hour ago—had abruptly given way to an eerie silence followed by subdued whisperings in the aftermath of a spine-chilling scene. During the height of the revelry, a hand had appeared out of thin air and had written on the wall a message in large letters. The occasion was a great banquet thrown by Babylonian King Belshazzar to celebrate the invincibility of Babylon. Babylon, which had been under siege by the troops of Cyrus the Great of Persia, considered that her walls were impregnable. So, on that evening of the new moon of the seventh month in 539bc, Babylon's powerful elite celebrated and drank toasts. Belshazzar had even insisted that the sacred vessels taken from the temple in Jerusalem by his grandfather decades earlier be brought. He wanted to use them as drinking goblets. Then the handwriting on the wall appeared, and the party came to a stunned halt. The message inscribed on the wall read, "MENE, MENE, TEKEL, UPHARSIN." The words were well-known Chaldean terms for units of weight, but their significance was utterly incomprehensible to those watching. The elderly man summoned by the king was named Daniel. He had been brought to Babylon as a teenaged Jewish captive, and had risen to high office under Belshazzar's grandfather. Daniel proceeded to explain to the king that the God of heaven had numbered his kingdom and that it was at an end. The king had been weighed in the balance scale and found wanting. That very night his kingdom was to be delivered into the hands of the besieging Medes and Persians. Within hours the Persian army had totally overrun the city, having entered it by coming underneath the mammoth city walls. The river, which flowed underneath the city walls, had been diverted by a canal several hours earlier. In the dark, pre-dawn hours, Persian troops marched through the dry riverbed and opened the massive city gates from the inside. Before the sun rose, they had conquered Babylon and executed King Belshazzar with a sword. Confronted by the evening's events, Daniel's mind was drawn back to a scene that had occurred some 65 years earlier. Though he had then been a young man still in his teens, he had been brought into the presence of the ruler of what was then the most powerful country on earth. His own life, and the lives of his closest friends, had hung in the balance that day. Daniel's purpose in being brought before King Nebuchadnezzar, Belshazzar's grandfather, had been to interpret a baffling dream that the king had experienced a few days earlier. Daniel had boldly announced to the skeptical, agitated ruler that there is a God in heaven who is a revealer of secrets. He then presented a God-inspired interpretation of the king's strange dream. In 604bc, the Chaldean army, under King Nebuchadnezzar, swept from Carchemish down the Jezreel Valley and captured the city of Jerusalem, reducing Judea to a tributary state. Several of the children of prominent Jewish families were taken back to Babylon as captives. During the decades that followed, one of those captives, Daniel, rose to hold high offices of trust in Babylon. The God of Israel, whom he continued to serve faithfully, gave Daniel many visions and interpretations of visions which he recorded in the book of Daniel. Look carefully at the prophetic outline of world events that God inspired Daniel to record. The Bible really does interpret itself, and the book of Daniel is pivotal to understanding the book of Revelation and other end-time prophecies. Daniel 2:1 describes King Nebuchadnezzar's troubling dream, hidden from the king's magicians and astrologers. They failed to recount back to him this puzzling dream. Finally Daniel came in to the king and explained to him that there is a God in heaven who is a revealer of secrets, and that He would reveal to Daniel not only the dream, but also its interpretation (v. 28). Daniel then explained to the king that in his dream he had seen a great image rising above the plains of Shinar. This mammoth image had a head of gold, shoulders and chest of silver, thighs of brass and legs of iron. The iron legs ended with feet which were composed of a mix of iron and clay (vv. 31–33). Nebuchadnezzar had in his dream watched a great stone of supernatural origin ("cut out without hands") come down from heaven and smash the image on its ten toes, at which point the whole image was turned to chaff and blew away. The stone became a huge mountain and filled the whole earth (vv. 34–35). What did this mean? Remember that the Bible interprets itself! Daniel was inspired to tell Nebuchadnezzar in Daniel 2:38, "You are this head of gold." He also told the king in Daniel 2:39–40 that three more kingdoms would each arise in turn after him. Daniel was inspired to record for us that four great kingdoms or empires would in succession dominate history, after which the God of heaven will set up His everlasting kingdom at the time of the final ten kings—which are represented by the toes on the feet of the "iron legs" of the fourth kingdom (vv. 41–44). Daniel 2:28 emphasizes that the living God whom we serve is a "revealer of secrets." The king's dream was meant to reach from the days of ancient King Nebuchadnezzar to "the latter days" of this world, culminating with the return of Jesus Christ and the establishment of the Kingdom of God on this earth (v. 44). Have the events Daniel foretold come to pass just as he foresaw? They absolutely have, as we shall see. In Daniel 5, we read of the events surrounding the fall of Babylon to the armies of King Cyrus the Great. The empire of the Medes and the Persians was the "second kingdom" that arose after Babylon. History tells us that the reign of the vast-reaching Medo-Persian Empire established by King Cyrus continued just over 200 years. Then, beginning in 333bc at the Battle of Arabella, the Persian Empire collapsed and the third great world-ruling kingdom took over. This was the Greco-Macedonian Empire under Alexander the Great. The Hellenistic empires of Alexander's successors dominated the Middle East for about 300 years until they were finally swallowed up, one by one, by the fourth great world-ruling empire—the kingdom of iron. This fourth kingdom, clearly identified in history as the Roman Empire, was prophesied to continue as two "legs" all the way down to the end-time. In that end-time, the ten toes (or kings, Daniel 2:44) would constitute the final embodiment of this system that had its origins in ancient Babylon. If we let the Bible interpret itself, this progression of four world-ruling kingdoms is clear. In Daniel 7:1–3, we find that decades after his interpretation of King Nebuchadnezzar's dream, Daniel himself had an unusual dream in which he stood staring transfixed at dark swirling clouds and a raging sea. From this stormy sea he saw "four great beasts" arise and proceed, one by one, to shore. The first was like a lion, the second like a bear and the third like a four-headed leopard. The fourth Beast was described as a terrible creature with huge iron teeth (vv. 4–7). Out of the head of this fourth Beast arose ten horns. The end of Daniel's vision revealed a time when "the saints of the Most High shall receive the kingdom, and possess the kingdom forever, even forever and ever" (Daniel 7:18). Remember, the vision in Daniel 2 also ended at the establishment of the kingdom of heaven. Should we let our imaginations soar in trying to discern the identity of these creatures, or should we let the Bible interpret itself? According to verse 17, these four creatures which arose successively (vv. 3–7) symbolize four kings or kingdoms. According to verse 23, the fourth Beast represents the "fourth kingdom upon the earth." We have already seen from Daniel 2 a succession of four kingdoms. The scenarios recorded in both Daniel 2 and Daniel 7 recount four great world-ruling empires, which were to arise successively. Each scenario ends with the establishment of the Kingdom of God to rule the earth. Clearly these two visions are recording different details of the same set of events. When we compare the visions of Daniel 2 and Daniel 7, we find that the first kingdom of Daniel 2—the head of gold—is equated with the lion, the king of beasts, in Daniel 7. The second kingdom—the silver of Daniel 2—is compared to a bear in Daniel 7. The third kingdom—the brass of Daniel 2—parallels the four-headed leopard in Daniel 7. Why four heads? History records that after Alexander's death, his empire was divided among four of his generals. This four-fold division was prophesied in Daniel 8:8. All four kingdoms were Greek in culture and language. They were a divided continuation of the empire that had been unified under Alexander for less than a decade. Just as Persia's ponderous size and might was symbolized by a bear, the lightning-like quickness of Alexander's Greek armies was well described by the leopard metaphor. Daniel 8 records more details of the interaction of the second and third kingdoms—Persia and Greece. Daniel 8:3–4 describes a two-horned ram going out to subdue everything in all directions. According to Daniel 8:20, this ram represented "the kings of Media and Persia." A powerful he-goat with one great horn coming up from between his eyes then defeated the ram completely (vv. 5–7). According to verse 21 (KJV), "the rough goat is the king of Grecia: and the great horn that is between his eyes is the first king." After Alexander's death ("the great horn was broken" v. 8, KJV), "four kingdoms shall stand up out of the nation, but not in his power" (v. 22, KJV). This is why, in Daniel 7, we see the third kingdom described as a four-headed creature. These events set the stage for the fourth kingdom described in Daniel 7, too terrible to be characterized by one of the above animals. Daniel 2 characterizes this kingdom with two legs of iron, and Daniel 7 portrays it as a creature with huge iron teeth. Daniel 2:40 explains, "And the fourth kingdom shall be as strong as iron, inasmuch as iron breaks in pieces and shatters everything; and like iron that crushes, that kingdom will break in pieces and crush all the others." Notice what Daniel 7:19–23 reveals about this fourth kingdom. "Then I wished to know the truth about the fourth beast, which was different from all the others, exceedingly dreadful, with its teeth of iron and its nails of bronze, which devoured, broke in pieces, and trampled the residue with its feet… The fourth beast shall be a fourth kingdom on earth, which shall be different from all other kingdoms, and shall devour the whole earth, trample it and break it in pieces." It is this fourth kingdom, the Roman Empire that is pictured as continuing in one form or another until the time of Christ's return. Does history confirm this? Absolutely! Just as Medo-Persia had absorbed Babylon, and Alexander the Great had absorbed the empire of the Medes and Persians, so the Romans absorbed all four of the "heads" that had sprung from Alexander's empire. When Alexander died at Babylon in 323bc, an attempt was made to hold his empire together. A regency was proclaimed to govern in the joint names of his nephew and his unborn son. This attempt failed. Within a few years, his empire was divided among four Greek generals who proclaimed themselves kings, just as Daniel had foreseen (Daniel 8:21–22). In 307bc, Antigonus and his son Demetrius "took the title king, whereupon Ptolemy and Seleucus, Cassander, and Lysimachus did the same. The unity of Alexander's empire was thus openly ended" (Encyclopedia of World History, William L. Langer, 1968, p. 90). Cassander seized Greece and Macedonia and, with the aid of Lysimachus and Seleucus, triumphed over Antigonus who was slain at the Battle of Ipsus in 301bc. In turn, however, Cassander's dynasty was overthrown in 276bc by Antigonus' grandson, Antigonus II, who established a dynasty that held Greece and Macedon until the Roman conquest in 168bc, when this area became absorbed into the Roman Empire. Lysimachus, who seized Asia Minor and proclaimed himself king in 305bc, was eventually defeated and slain at the Battle of Corpedium in 281bc by his erstwhile ally, Seleucus. Eumenes I, the Seleucid governor of Pergamum (Asia Minor), succeeded in becoming virtually independent of the Seleucids by about 260bc. By 230bc his successor had taken the title "king." When Attalus III died in 133bc, his will left his kingdom of Pergamum and Asia Minor to the Romans. Rome had thus absorbed the second head of Daniel's leopard. Seleucus established a kingdom which stretched eastward to Babylon and westward to Syria. The Seleucid dynasty which sprang from him continued until 64bc, when the Roman general Pompey made Syria a province in the expanding Roman Empire. The Macedonian general Ptolemy took the title "king" at the same time as his three contemporaries, Cassander, Lysimachus and Seleucus. His kingdom was centered in Egypt and continued under his descendants down to Cleopatra's death in 30bc following her defeat by the Romans. Julius Caesar's nephew Octavian (later known as Augustus Caesar) defeated the forces of Cleopatra and Marc Antony at the Battle of Actium, and absorbed Egypt into the Roman Empire. "This brought to an end the last of the Hellenistic monarchies" (Langer, p. 97). With this conquest, all four heads of the Greco-Macedonian leopard were an integral part of the Roman Empire, the fourth Beast of Daniel 7. Napoleon, Hitler and Saddam Hussein have something in common. So also do Mikhail Gorbachev, Benito Mussolini, Franklin Roosevelt and various and sundry popes. Some have labeled them—and countless other figures, well known and obscure—as the mysterious Beast described in the book of Revelation. Institutions such as the League of Nations, the United Nations, international communism—and even the United States government—have in the last century also been called the Beast. Other commentators have argued that the book of Revelation is only to be understood as a metaphor for the battle between good and evil. To these commentators, the Beast is the personification of evil, not a historical figure or institution. "But," some might ask, "aren't there all sorts of views and interpretations of Bible prophecy?" Of course there are! It seems that most would-be interpreters start with what they see on the world scene and then attempt to read it back into the Bible. This is why nearly all who commented on Bible prophecy in the 1950s and 1960s identified the Soviet Union's communist empire as the scarlet-colored Beast of Revelation. A few years ago it was Saddam Hussein. Today, many commentators identify the "New World Order" or the United Nations as the Beast. There seem to be just about as many interpretations as there are interpreters. The Creator God does not intend Bible prophecy to be understood by an exercise in creative imagination. Neither is prophecy to be understood by looking at contemporary events and attempting to read them back into the Bible account. Rather, no prophecy of the Scriptures is to be of any private interpretation (2 Peter 1:20). If the Bible uses symbolic language, it contains in its text the keys to understanding what the symbols mean. The elderly Apostle John stood upon the sandy shore of the Isle of Patmos in the Mediterranean Sea. As he gazed out to sea, the scene before him seemed to change. Dark clouds lowered and the sea appeared to churn. As he stared transfixed, a strange creature rose up out of the water. This creature had the body of a leopard, the mouth of a lion and the feet of a bear. It thus embodied the main characteristics of the first three creatures Daniel had seen in his vision recorded in Daniel 7. The Beast that John saw also had seven heads and ten horns. We are told that "the dragon" gave this creature its power and authority. Finally, we are told that one of this creature's heads was wounded to death and was then healed. After the healing, the creature continued for 42 months (Revelation 13:1–5). An almost identical scene is described in Daniel 7. In his vision, Daniel had seen four creatures—a lion, a bear, a four-headed leopard and a fourth terrible creature with ten horns—arise up out of a dark and stormy sea (Daniel 7:1–7). The creatures that Daniel saw are clearly identified as the succession of empires from Nebuchadnezzar's Babylon, to Medo-Persia, to Alexander's Greek empire which split four ways after his death and finally to the Roman Empire. It is out of the fourth creature, symbolizing the Roman Empire, that the "ten horns" arose. Notice the similarity of the two accounts. In each case there are seven heads. In Revelation 13 John saw one creature, not four distinct ones, but the characteristics were the same: seven heads and ten horns were described. In each account the prophets used the symbolism of a lion, a bear and a leopard. Why were there differences in the visions? When Daniel saw his vision, it was virtually all future. Babylon, symbolized by a lion, was on the scene and the others were yet to come. When John wrote, more than 600 years later, Babylon, Persia and Greece had all passed into history. John focused not on the different heads to arise, but upon the details concerning the seventh head, the one that was extant in his day and whose history he recorded in advance. Where Daniel focused on four empires, John focused on one system derived from Babylon. He saw the various empires as merely different heads of the same creature. Daniel identified what he saw as beginning in his days and continuing on until the return of Christ when the saints would possess the kingdom (Daniel 7:18). The Roman Empire of John's day was simply a continuation of what had begun in Babylon. Remember that the Bible interprets its own symbols. Daniel 7:23 makes plain that the four creatures (embodying seven heads) represent kingdoms. In Revelation 17:9–10, the seven heads of the Beast are identified as "seven mountains" or "seven kings." According to Daniel 7:24 and Revelation 17:12, horns symbolize kings or kingdoms. As for the dragon which is the source of power for this system, Revelation 12:9 tells us "the great dragon… [is] that serpent of old, called the Devil and Satan." What of the head "wounded to death"? Remember, of the seven-headed Beast described in Revelation 13, only the final seventh head, the Roman Empire, was extant in John's day. The fulfillment of the previous six heads had already passed into history by the time of John's writing. Did the Roman Empire receive a deadly wound, then later come back to life and continue "forty-two [prophetic] months"? The date that has for centuries been taken as the line of demarcation between ancient and medieval history is 476ad. This date, the traditional "fall" of the Roman Empire, marks the murder of the last Roman emperor of the West, Romulus Augustulus, by the barbarians. In the next chapter we will examine this empire's subsequent revival. But first, notice another detail described in both Daniel 7 and in Revelation 13. In each account we read of ten horns coming up out of the Beast's seventh head, the Roman Empire. John saw each of these horns as having a crown upon it (Revelation 13:1) and Daniel explained that they represented kings or kingdoms (Daniel 7:24). Daniel also tells us that from among these ten horns came up a "little horn" which caused the first three to be "plucked out." To see what this means, we must look further at the history of the old Roman Empire. The Story of the First Three "Horns"
In 286ad, the emperor Diocletian divided the Roman Empire into East and West for administrative purposes. This was symbolized by the "two legs" described in Daniel 2. Serious trouble lay ahead, however, for the western "leg." By 400ad, the empire in the West was in its death throes. Following barbarian incursions on the frontiers, Rome itself was sacked and looted—for the first time in eight centuries—by Alaric and his Visigoths in 409ad. officially recognized each as a continuation of legitimate Roman government in the West. Yet another emerging ruler in the West eventually obtained their overthrow and ouster. This emerging ruler was the bishop of Rome. While the western emperors grew weaker, his power and stature increased. This involved not only a growing religious power over the professing Christian community, but civil and political power as well. The Vandals, the Herulii and the Ostrogoths particularly disturbed him. While they professed Christianity, it was a non-Trinitarian brand called Arianism. They were not "orthodox" and were therefore viewed as a threat to the religious unity of the empire. The Vandals invaded North Africa in 429ad. After several years of fighting, they entered into a treaty in 435 whereby the Romans "recognized" them as the legitimate continuation of the empire in North Africa (Langer, p. 135). The Vandals sought to expand their power as successor to Rome. In 455 they even pillaged the city of Rome itself. They were so thorough that to this day the name "vandal" is attached to those who destroy others' property. But ultimately, the Vandals were uprooted. "In Africa the Vandals were hated as Arians [by the Church of Rome] and they had to deal with serious Berber revolts, but their power was not broken until the 533–548 Vandalic Wars of [eastern emperor] Justinian" (Langer, p. 159). In 476, about 20 years after the Vandals sacked Rome, the Herulii, under their leader Odoacer, deposed Romulus Augustulus, the last western Roman emperor. The eastern emperor, Zeno, "recognized" Odoacer as the legitimate continuation of Roman government in Italy. Odoacer was an Arian, however, and after an appeal by the Bishop of Rome, Zeno dispatched Theodoric, the leader of the Ostrogoths, to drive out the Herulii in 488. "The orthodox bishops of Italy, disliking Odoacer's Arianism, supported the Arian invader [Theodoric] as representing an almost orthodox emperor. With their help Theodoric broke Odoacer's sturdy resistance in five years of war, and persuaded him to a compromise peace [in 493]. He invited Odoacer and his son to dine with him in Ravenna, fed them generously, and slew them with his own hand" (The Story of Civilization, Will Durant, vol. 4, pp. 97–98). Ostrogothic rule of Italy, though accepted as a means of getting rid of the Herulii, remained unpopular with the bishop of Rome and the Roman Catholic population. General Belisarius, who had been sent from Constantinople in 533ad with 500 transport ships and 92 warships to rid Africa of the Vandals, came to Italy in 536 to drive out the Ostrogoths. "The Ostrogothic forces were meager and divided; the people of Rome hailed Belisarius as a liberator, the clergy welcomed him as a Trinitarian; he entered Rome unopposed" (Durant, p. 109). Thus the first three "horns" were plucked up at the behest of the bishop of Rome, the "little horn" of Daniel 7. The stage was being set for the true revival of the Roman Empire in the West. This revival in 554, like all the revivals that have occurred since, involved the bishop of Rome's blessing and his role as an intimate player in the various continuations of the empire of ancient Rome. Rome—Ancient and Future Master of the World? The tourist posters display a fascinating Rome—a city of seven hills covered with the architectural glories of the past and present. Rome is a city of contrasts. Old buildings and ancient ruins jostle side by side with a thriving, modern city. Twenty-seven centuries have come and gone since its legendary founding at the hands of Romulus and Remus. During this long expanse of time, this remarkable city has played an unparalleled role in the history of western civilization, as a seat of ongoing intrigue and power! Nestled within the city of Rome is the world's smallest sovereign territory—Vatican City. Maintaining its own diplomatic relations with all the major powers, this minuscule city-state, ruled by the Roman pontiff, is a full participant in international affairs. The Vatican aspires to be far more than a mere participant, however. It seeks to once again achieve the guiding role it played for so many centuries. Though Rome's ancient empire received a fatal wound with the death of the last emperor in 476ad, that was not the end of the story! The first three kingdoms springing out of the old Roman Empire, the Vandals, Herulii, and Ostrogoths, were uprooted. The might of the eastern emperor, Justinian, accomplished this "plucking up" at the behest of Rome's pope. Justinian's "imperial restoration" in 554 "healed" the "deadly wound" and launched the first of six historical attempts to revive and carry on the empire of ancient Rome. And according to the Bible, there is a seventh and final revival yet to come. Your life will be affected profoundly by events yet to take place in what its residents call the "eternal" city! With the conclusion of the Gothic Wars in 553ad, Italy was left in poverty and disorder. Rome had been captured, besieged, looted and starved. Finally the armies of the eastern Roman emperor Justinian stood victorious. Justinian's armies had succeeded in reconquering Italy and remnants of the western empire, but how was he to govern it? The answer lay in an alliance of church and state that has shaped the history of western Europe ever since. Though secular authority in the West had collapsed, "the survival of ecclesiastical organization [under the bishop of Rome] appeared even to the emperors as the salvation of the state. In 554 Justinian promulgated a decree requiring that 'fit and proper persons, able to administer the local government, be chosen as governors of the provinces by the bishops and chief persons of each province'" (Durant, pp. 519–520). This event is known in history as the Imperial Restoration. The emperors in Byzantium continued as nominal rulers of a revived Imperium Romanum in the West from 554 until 800. By the terms of Justinian's decree, however, the bishops of Rome (now called popes) held the reins of power and were thus the real riders sitting astride the imperial Beast in the West. It is important to note at this point a significant difference between the Beast described in Revelation 13 and the one described in Revelation 17. The Beast of Revelation 13 corresponds to what Daniel saw in Daniel 7. John described a creature that began in Nebuchadnezzar's Babylon and continued on to his day. Out of the seventh head, the Roman Empire, would arise ten kingdoms. Daniel 7 explained that the first three of those ten horns would be "plucked out." However, the Beast of Revelation 17 is different. It is a creature ridden by the woman, unlike the earlier description. The Beast in Revelation 17 is the one "that was and is not" (v. 11)—the Roman Empire after the deadly wound is healed. This is what history has ironically and misleadingly labeled the "Holy" Roman Empire, dominated by the Church of Rome, which has continued from 554ad through various revivals to modern times. Revelation 17:11 explains that this Beast "is the eighth, and is of the seven, and goeth into perdition" (KJV). It is a continuation of the seven-headed creature described in Revelation 13, but it is in some ways like an eighth head on that creature since it begins after the last head of the Beast of Revelation 13 receives a "deadly wound." The seven heads of the Revelation 17 Beast are seven kingdoms (v. 10). They are the seven resurrections of the Holy Roman Empire, corresponding to the last seven of the "ten horns" of Daniel 7 and Revelation 13. 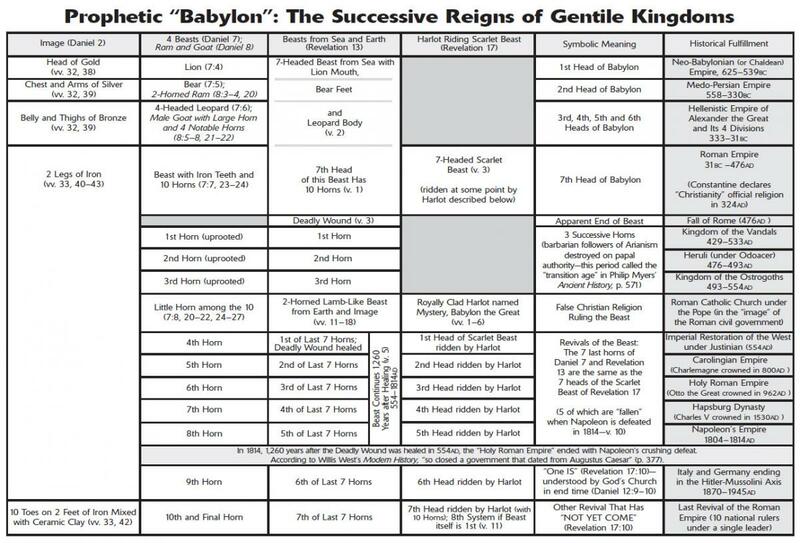 The ten horns of Revelation 17 are also ten kings or kingdoms (v. 12). They give power to the final revival of the Holy Roman Empire and will be destroyed by Christ at His coming (v. 14), thus corresponding to the ten toes on the image described in Daniel 2. Now, look more closely at the history of the "seven heads" mentioned in Revelation 17. In the years after the imperial restoration, the eastern emperors generally focused their attention closer to home. The protection and security that the eastern emperors provided for the West became negligible. Private negotiations between Charles, King of the Franks, and Leo, Bishop of Rome, were held to resolve this problem. The results of the negotiations were made manifest in 800ad. "On Christmas Day, as Charlemagne [King of the Franks], in the chlamys and sandals of a patricius romanus, knelt before St. Peter's altar in prayer, [Pope] Leo suddenly produced a jeweled crown, and set it upon the King's head. The congregation, perhaps instructed beforehand to act according to ancient ritual as the senatus populusque Romanus confirming a coronation, thrice cried out: 'Hail to Charles the Augustus, crowned by God the great and peace-bringing Emperor of the Romans!' The royal head was anointed with holy oil, the Pope saluted Charlemagne as Emperor and Augustus…" (Durant, pp. 468–469). After several years of dispute, the eastern emperor at Byzantium recognized Charlemagne as co-emperor. The Imperium in the West passed to yet a second head since the days of the "deadly wound" in 476 and its subsequent "healing" in 554. Both times were at papal behest and with papal blessing. As historian Will Durant puts it: "Out of this intimate co-operation of Church and state came one of the most brilliant ideas in the history of statesmanship: the transformation of Charlemagne's realm into a Holy Roman Empire that should have behind it all the prestige, sanctity, and stability of both Imperial and papal Rome" (Durant, p. 468). During the century and a half that followed Charlemagne's coronation, his empire slowly disintegrated under weak successors. By 936 the German Saxons had become the most powerful group in central Europe. In 955 Otto, Duke of the Saxons and King of the Germans, defeated the Magyars who were attempting to invade western Europe from the East. Several years later he entered Italy at the request of Pope John XII to restore him to power and in the aftermath received the imperial crown at Pavia in 962. "Thus once again the ghost of the Roman empire was summoned to sanction the successful state building of a semi-barbarian king" (Handbook of Western Civilization, William McNiel, p. 317). Otto's coronation marked the inauguration of a third head in the continuity of the western empire since Justinian's imperial restoration. How did Otto's contemporaries and their successors view the significance of his revival of the empire? As historian Robert Hertzstein wrote, "the Empire was understood not as a mere term, but as a universal Christian regent for God on Earth, to exist until the coming of the Anti-Christ. Like Charlemagne, Otto received his throne through the Papal claim that the Roman Church had been the only Imperial elector since the early fourth century… The Holy Roman Empire was thus to a large extent German in its ethnic and political base, Christian in its moral justification, and Roman in its claim to legitimacy and universality" (The Holy Roman Empire in the Middle Ages, ed. Hertzstein, p. viii). In an essay titled "The Empire as a Regency for God on Earth," noted Austrian historian Friedrich Heer wrote: "The task of the Empire was to be God's protagonist on earth, to fulfill His aims here, to protect Christianity and the Church, and to preserve the righteousness of God and the divine order of the universe on earth. The earthly Empire was the transitory reflection of the eternal City of God… In the imperial symbols this claim was displayed to the whole world: with the imperial apple, filled with earth from the four corners of the world, the Emperor holds the whole world in his hand… [the emperor] called the imperial crown corona urbis et orbis [the crown of Rome and of the globe]; he viewed himself as the caput mundi and as the dominator obris et urbis [head of the world and ruler of the globe and of Rome]" (Hertzstein, pp. 64–65). Otto's revived empire continued for almost 300 years. Finally, with the death of Conrad IV in 1254, the empire became so rent by rival factions that a 19-year interregnum (time without an emperor) resulted. In its aftermath, Rudolph I was elected emperor in 1273—the first of the Hapsburg family to be elevated to the imperial throne. The apex of this fourth revival of the old Roman imperium was the crowning of Rudolph's descendant, Charles V, in Bologna by Pope Clement VII in 1530. Charles ruled over a vast empire. From his mother (Joan, daughter of Ferdinand and Isabella of Spain) he had inherited Spain and all Spanish possessions in the New World. From his father he inherited the vast Hapsburg domains in Germany, Italy and central Europe. After Charles V, Hapsburg power waned. By the 18th century, "Holy Roman Emperor" was an increasingly empty title. In the final decade of the 18th century, all of Europe was shaken by the French Revolution and its aftermath. A man both highly gifted and supremely ambitious came to power in France. His name was Napoleon, and he aspired to far more than the presidency of a French Republic or even becoming a new king of France. His ambition could only be satisfied by the reestablishment of the Roman Empire—with himself as emperor. As historian Will Durant notes, "he dreamt of rivaling Charlemagne and uniting western Europe" (The Story of Civilization, Will Durant, vol. 11, p. 243). Napoleon considered himself a successor to Caesar and Charlemagne. Staging a plebiscite which he won by a vote of 3,572,329 to 2,569, Napoleon had the French Senate proclaim him emperor on May 18, 1804. Immediately he began negotiations with Pope Pius VII to come to Paris and consecrate him as emperor. The negotiations were successful and the coronation occurred on December 2. The Hapsburgs of Austria felt keenly the successive diplomatic and military pushes of Napoleon, especially his assumption of the imperial title. Two years later, at Napoleon's instigation, 16 princes and their states withdrew from the Holy Roman Empire, formed the Confederation of the Rhine and asked Napoleon to take them under his protection as a part of his empire. The following month, on August 6, 1806, Francis II renounced his now-empty title as emperor of the Holy Roman Empire. Napoleon's European empire now stretched from the Atlantic to the Elbe. Spain, France, Holland, Belgium, western Germany and eventually all of Italy formed his renewed empire. Napoleon thus became the fifth head of the revived western Imperium since the days of Justinian. Napoleon's empire was not destined to be long-lived, however. A British-led coalition brought about his defeat and abdication in 1814. This ended a period of 1,260 years since the imperial restoration under Justinian in 554. Thus the prophecy in Revelation 13:3–5 of the Beast receiving a deadly wound, the wound being healed, and then the Beast "given authority to continue for forty-two months" was fulfilled (42 "months" of 30 days equal 1,260 "days"). Napoleon's abdication marked the end of an epoch. According to prophecy there were yet to be two more attempted revivals of the glory and grandeur of ancient Rome. After Napoleon's collapse in 1814, Germany and Italy remained divided and impotent for the next half-century. Each was divided into a number of small states and principalities and was rent with internal squabbles. By 1871, Bismarck had succeeded in uniting all of non-Hapsburg Germany under the Prussian king while Garibaldi succeeded in uniting all of Italy under the northern Italian king of Sardinia-Piedmont. Fifty years after the inauguration of Garibaldi's union, a strong man, who had visions of once again restoring the grandeur and glory of ancient Rome, came to power in this united Italy. His name was Benito Mussolini and he led his Fascists to power in 1922. The Fascists derived their name from the fasces of Imperial Rome. The fasces was an ax wrapped in a bundle of rods signifying unity and authority. It was carried by Roman consuls as a symbol of their office. Since 1870, when King Victor Emmanuel's Italian army had defeated the armies of the pope and captured Rome, there had been a tense standoff between the popes and the new rulers of Italy. Finally in 1929 Mussolini signed the Lateran Treaty with the papacy, which established papal sovereignty over Vatican City and made Mussolini's government the first Italian government in modern history to be recognized officially by the pope. The Concordat signed between the papacy and Italy's Fascist government was a prelude to one signed four years later between the papacy and the German Nazi government. The role of the Vatican in establishing both Mussolini and Hitler in power is detailed in Hitler's Pope, the Secret History of Pius XII (John Cornwell, Viking, 1999). centuries, the reappearance of the Empire on the fated hills of Rome." Mussolini then proceeded to enter into an alliance with Adolph Hitler, ruler of Germany since 1933, that resulted in the Rome-Berlin Axis of World War II. This sixth attempt at uniting Europe by reviving the concept of imperial Rome went down in flames and ignominy in 1945. Many said in the aftermath of World War II that Europe's day was gone. Cities, countryside and national economies were devastated throughout the continent, especially in Germany. Many thought Russian communism was the wave of the future in Europe. After all, Stalin quickly planted the Russian boot on as much of Europe as he could immediately after the war. The idea of a German-led Europe playing a dominant role in world affairs was something that most observers said could never again happen. Yet in 1957, within 12 years of the end of World War II, the Treaty of Rome instituted a fledgling Common Market consisting of France, West Germany, Italy and the three Benelux states. This was the direct predecessor of today's powerful European Union. Is this European Union setting the stage for the future—a seventh and final attempt at resurrecting the grandeur and might of imperial Rome? When Daniel 7 and Revelation 13 are compared, we see that the "ten horns" (kingdoms) sprang out of the Roman Empire, the seventh head of the Beast. The first three of these "horns," the Vandals, Herulii and Ostrogoths, were "plucked up" at papal behest. This fulfilled the prophecy of Daniel 7:7–8, 23–25, leaving the final seven "horns." Six attempts to restore the empire of ancient Rome occurred with papal sanction. They have come and gone, and are now part of the historical record. The story of the seven revivals (six in the past and one yet future) is also told symbolically in Revelation 17. Here we find pictured another Beast with seven heads and ten horns. This creature is different from that of Daniel 7 and Revelation 13—it is ridden by a woman, symbolizing a religious organization labeled "Mystery, Babylon the Great." In other words, it is a perpetuation of the old Babylonian mystery religion now grown great and powerful. The seven-headed creature of Revelation 17 is clearly the Holy Roman Empire, because "The seven heads are seven mountains on which the woman sits" (Revelation 17:9). In verse 10, the seven "mountains" are identified as seven kings or kingdoms. The creatures portrayed in Daniel 7 and Revelation 13 were not ridden by the woman. The Beast of Revelation 17 is. Like its predecessor, it has ten horns on its final head. In Revelation 17, the ten horns represent ten future rulers who will collectively give their power and authority to "the Beast"—an end-time revival of the old Holy Roman Empire. The time setting is yet ahead of us because these ten will fight against Christ at His return (Revelation 17:12–14, 17). This brings us back to the first vision that Daniel interpreted—the image in Daniel 2 of the two legs of iron ending in feet of iron and clay. The ten toes, five on each foot, were pictured as being smashed by Christ at His return prior to setting up the Kingdom of God on earth (Daniel 2:34–35, 42–44). The ten toes of Daniel 2 and the ten horns of Revelation 17 are synonymous, symbolizing ten rulers who will collectively support and give their allegiance to the seventh and final resurrection of the Roman Empire. The legs of the Daniel 2 image represent the Roman Empire divided into the Eastern Empire and the Western Empire by the emperor Diocletian in 286ad. Bible prophecy focuses on the continuation of the western empire—the Beast ridden by the "woman." Yet Daniel 2 shows that the eastern leg has a part to play in the final revival. The eastern Roman Empire continued with emperors ruling in Constantinople until 1453, when the Ottoman Turks overran the city and killed the last emperor, Constantine XI. But that was not the end of the eastern leg. In 1472, 19 years after the fall of Constantinople, the pope performed a marriage ceremony between Ivan the Great, Duke of Muscovy, and Zoe, niece and heir to the last eastern emperor. "The marriage was of importance in establishing the claim of Russian rulers to be the successors of the Greek emperors and the protectors of Orthodox Christianity… Ivan took the title Tsar, [or Czar] i.e., Caesar" (Langer, p. 342). Thus, down through history, the Roman Empire continued as two legs. Two individuals claimed to be the successors of Caesar. In the Latin, Germanic, Roman Catholic realm of the West the form of the title was Kaiser. In the Greek, Slavic, Orthodox realm of the East it was Tsar. The One who says He declares "the end from the beginning" reveals that eventually ten kings (or rulers) who are the successors of both the eastern and western "legs" will unite. They will form the last resurrection of the Roman Empire—the final embodiment of Babylon. There is some bad news ahead. These final ten rulers will give their support to a coming union of church and state in Europe, which will aspire to world dominance. As Johannes Haller, a popular German historian who died in 1947, put it: "In the memory of the German people the old [Holy Roman] Empire lives on as a time of greatness and splendor that must one day come to life again" ("The Greatest Epoch of the German People," 1944). After an interlude of apparent peace and prosperity, this system will plunge the whole world into a hellish nightmare. Unless God were to intervene by sending Jesus Christ back to this earth, utter destruction would result and no flesh would be left alive (Matthew 24:21–22, 29–30). Yet beyond the bad news there is good news—really the best news possible. In the days of this final union of European rulers, "the God of heaven will set up a kingdom which shall never be destroyed… it shall stand forever" (Daniel 2:44). Scarcely any prophetic subject has elicited more conjecture and speculation than the "mark of the Beast." In addition to a "mark," Revelation 13 also mentions an "image" of the Beast as well as the mysterious "number of his name"—666. What is the significance of these mysterious symbols? Before examining the number, the image or the mark, consider what we have established so far. The end-time Beast is clearly identified in your Bible as the modern successor to the empire of ancient Babylon. The prophet Daniel identified four successive kingdoms: Babylon, Persia, Greece and Rome. Rome, the "fourth kingdom," was to continue through seven revivals until the return of the Messiah, when the God of heaven will destroy the final revived Roman Empire and set up a kingdom that will endure forever. Since the Roman Empire is the Beast described by John in Revelation 13 and Revelation 17, the "mark" is a brand or mark of the Roman Empire. The "image" of the Beast must be something modeled or patterned after the Roman Empire. Before going further, notice that Revelation 13 mentions a second "beast" with an earthly, not heavenly, origin (v. 11). It outwardly masquerades as Christian, seeking to be identified with Christ, the Lamb of God (cf. John 1:29) but receives its power from the devil, that old dragon (Revelation 12:9). In prophecy, horns are used to represent rulership or authority, and this creature is pictured with two horns. Revelation 13:12 reveals that this second beast insists that all give their allegiance and loyalty to the Holy Roman Empire, the beast whose deadly wound was healed (v. 12). This second beast is described as performing great miracles, which will deceive humanity (vv. 13–14). In Matthew 24:24, Christ prophesied of "false Christs" who will deceive all but the very elect. Historically, was there an institution claiming to represent Christ ("like a lamb," v. 11) and holding sway over the populace by means of various "miracles" (v. 14)—an institution which taught the devil's false message that God's law was "done away" and which insisted that its adherents give their loyalty to the Holy Roman Empire? Throughout the medieval period, the Church of Rome did exactly this! Why the two horns? The Church of Rome is both an ecclesiastical and a civil government. The pope is both a religious leader and a civil head of state. Bible prophecy shows that the church-state union of the Middle Ages was a forerunner of end-time events whose scale will be far grander. What could possibly be considered the mark or brand of the Roman Empire? Whatever it is, within a few years it will be required for all of those who are going to participate in the economic system of Babylon the Great (Revelation 13:17). Yet those who accept it will, by their actions, call down upon themselves the undiluted wrath of God (Revelation 14:9–10). Whatever this mark is, it has been extant for centuries, because all of the righteous martyrs have rejected it (Revelation 20:4). Revelation 13, in describing the interaction of the Church of Rome and the medieval Holy Roman Empire, makes plain that the mark, the image and the number of the Beast's name were all extant during the Middle Ages as a precursor of end-time events. In years past, many suggestions have been advanced to identify this mark. Back in the 1930s, some tried to connect it with the Social Security cards required by the Roosevelt administration. Others have seen sinister implications in the universal product codes read by cash register scanners. Still others have been suspicious of bank ATM cards and other technological innovations. Many expect some sort of tattoo or hidden embedded computer chip to be foisted upon an unsuspecting populace. But unless we look at all that the Bible reveals about this subject, we will be unable to gain a clear understanding. Revelation 14:10 reveals that those who receive the mark of the Beast will have the wrath of God poured upon them. Notice the Apostle Paul's clear teaching about the recipients of God's wrath. Colossians 3:6 tells us that "the wrath of God is coming upon the sons of disobedience." The mark of the Beast is therefore a brand of disobedience to God. It marks those who refuse to keep God's commandments in spite of both the preaching of the two witnesses and even the final warning delivered by an angel of God (Revelation 14:9). The mark of the Beast stands clearly as a brand of disobedience to God and His laws. Does the Bible reveal a contrasting sign of obedience that identifies God's true people? Notice Exodus 31:13–17. Here God declared to ancient Israel that His Sabbaths were a sign between Him and His people forever! The Sabbath is the test commandment to identify the true God of creation and the people who are obedient to His commands and laws. Revelation 13 explains that the mark of the Beast, a brand of disobedience to God, is taken upon the hand and the forehead. Just as disobedience is described as worn upon the hand and forehead, so also is obedience to God's law. Notice Deuteronomy 6. "Now these are the commandments, the statutes, and the judgments which the Lord your God commanded to teach you, that ye might do them in the land whither ye go to possess it: That thou mightest fear the Lord thy God, to keep all his statutes and commandments… And thou shalt bind them for a sign upon thine hand, and they shall be as frontlets between thine eyes" (vv. 1–2, 8, KJV). The hand is symbolic of actions, while the forehead is the seat of intellect. Obedience to God involves both actions (hand) and will (forehead). The mark of the Beast is a brand of disobedience to God. Not only must this involve rejection of God's sign of obedience, the Sabbath, but also the acceptance of a counterfeit sign or mark. This mark is, in reality, a brand deriving from Babylon and Rome. Is there such a symbol that has come all the way down to modern times? In ancient Babylon, the kings served as high priests of the sun, Bel-Marduk. "To take the hand of Bel-Marduk" was part of the ceremony of installation as king in Assyria and Babylon ("Babylonian and Assyrian Religion," Encyclopædia Britannica, 11th ed.). The celebration of the winter solstice around December 25 was regarded as the birthday of the sun. It was a major holiday associated with gift-giving and the sacred evergreen tree. Not only did much of Babylonian pagan worship involve the sun, but so also did the worship of each of Babylon's successors in its own turn, first in Persia and later in both the Hellenistic world and Rome. In fact, by the time each of Daniel's four beasts arose, sun worship had risen to prominence as the imperial religion. Persia was Babylon's first successor. Ancient Persian religion centered on the worship of Mithras, the god of light. As a result of Babylonian influence, however, Mithras came to be identified with the Babylonian sun god. The Greeks of Asia Minor identified Mithras with their ancient sun god, Helios, and contributed to the westward spread of the cult of the sun. Alexander the Great traveled to Egypt to the Temple of Amon-Ra to be proclaimed by the priests as the literal son of the sun god. And what of Rome? "Mithras, identified with Sol Invictus at Rome, thus became the giver of authority and victory to the imperial house" ("Mithras," Encyclopædia Britannica, 11th ed.). Lempriere's Classical Dictionary states that Sol, the sun god of Rome, was worshipped as "the Baal or Bel of the Chaldeans [Babylonians]" (p. 590). Sun worship and its symbols were adopted by the Roman Empire from her predecessors and passed on to the entire western world! In modern Lebanon today there is a tiny Arab village called Baalbek. Located there are the ruins of two majestic temples, once the pride of Heliopolis, the Greco-Roman "City of the Sun." Notice the explanation of historian Will Durant: "Augustus planted a small colony there, and the town grew as the sacred seat of Baal the Sun-God.... Under Antoninus Pius and his successors Roman, Greek, and Syrian architects and engineers raised, on the site of an old Phoenician temple to Baal, an imposing shrine to Iuppiter Heliopolitanus" (The Story of Civilization, Will Durant, vol. 3, p. 511). Thus the Roman Jupiter became identified with Baal the ancient sun god. Another great center of pagan sun worship was the temple at Heliopolis in Egypt, where a great obelisk sacred to the sun was located. Around 40ad, the Roman emperor Caligula had this obelisk transported from Egypt to Rome and erected in his circus on Vatican Hill. In 1586, upon order of Pope Sixtus V, this ancient obelisk—83 feet in height and weighing 320 tons—was moved a short distance to its present location. Requiring a crew of 800 workmen, 160 horses and 45 winches, the obelisk was exactly centered before the entrance of St. Peter's Cathedral—where it remains to this day. "It was natural that as the centre of gravity of the Roman empire moved eastwards, sun-worship should grow in power. It was already strong in imperial propaganda; Nero's Golden House was an appropriate home for the incarnate sun, and Antonius accorded the sun peculiar honour. Under the Severan dynasty sun-worship became dominant; the sun-god was portrayed with Severus's characteristic beard, and the emperor took the title INVICTVS (unconquered), which was the peculiar epithet of the sun… The sun was a superb unifying symbol and rallying-point for the whole empire… in AD 274 Aurelian established the sun-god as the supreme god of the Roman empire" (p. 175). Aurelian, emperor from 270–282ad, ascribed much of Rome's third-century moral and political chaos to religious disunity. He sought to unite the whole empire in the "worship of the sun-god, and of the Emperor as the vicar of that deity on earth… He built at Rome a resplendent Temple of the Sun, in which, he hoped, the Baal of Emesa and the god of Mithraism would merge… Aurelian advanced that Orientalization of the monarchy which had begun with Elagabalus and would complete itself in Diocletian and Constantine" (Durant, p. 639). Constantine, considered Rome's first "Christian" emperor, was himself a devotee of the sun god. "In fact the emperor Constantine's Christianity was ambiguous. His family owed traditional allegiance to the sun-god; the famous vision of the cross as he marched on Rome came to him from the sun; the sun continues to appear on his coins through the decade, and on his arch at Rome; his own statue at Constantinople bore the rayed crown of the sun-god" (Parrinder, p. 175). By the first century, the seven-day planetary week was being popularized at Rome. The seven-day week itself originated at creation (Genesis 1) and the knowledge of the correct weekly cycle was preserved by the Jews. However, in ancient Babylon each of the seven days of the week became associated with what the ancients called the seven planets: Sun, Moon, Mars, Mercury, Jupiter, Venus and Saturn. This is significant because it set the stage for an imperial proclamation that indelibly stamped upon the Christian-professing world a mark, or brand, derived from ancient sun worship. The Encyclopædia Britannica records: "The earliest recognition of the observance of Sunday as a legal duty is a constitution of Constantine in 321ad, enacting that all courts of justice, inhabitants of towns, and workshops were to be at rest on Sunday (venerabili die solis)" ("Sunday," 11th ed.). By using the Latin term properly translated as "venerable day of the sun," Constantine identified the first day of the week with that day dedicated from ancient times to Sol, the sun. Through the proclamation of a Roman emperor, a mark from ancient Babylon and the cult of sun worship was forcibly stamped on the inhabitants of the Roman Empire. That mark—with other associated symbols of sun worship—has continued right on down through the medieval period to modern times. We have seen that the second beast mentioned in Revelation 13 is none other than the Church of Rome, while the first beast mentioned is the Roman Empire. The Church of Rome, this second beast, instructed that an "image" of the first beast, the Roman Empire, should be made. What is an image? It is a copy, model, representation or counterpart. The image of the Beast is therefore a counterpart to the old Roman Empire—something modeled after the pagan Roman kingdom or government. Notice the plain statement of British historian and statesman James Bryce that the "papal [system] itself had been modeled after the elder Empire" ("A History of the Holy Roman Empire Must Be Deduced from Its Theory," Hertzstein, p. 53). Revelation 13 explains that the false church, the second beast, insists that all people give total loyalty and devotion (worship) to the image, the religious organizational structure modeled after the old Roman Empire. It "causes" to be killed those who refuse (Revelation 13:15). During the Middle Ages, the church did not carry out the punishment itself. It simply declared as heretics those who refused adherence to the system. Those declared anathema from the church were considered as enemies of the state and were accordingly dealt with by the civil government. The first-century Roman Empire was authoritarian. But most do not realize that for many offices election was also an honored and accepted practice. Even the emperor was elected—ostensibly by the Senate, though more commonly in fact by the Praetorian Guard or simply by the army. Some of the very elders that Paul admonished (Acts 20:30) later became ringleaders in deceiving God's people into following the pattern of Roman municipalities by holding public church meetings with elected officers. Notice the statements of historian Arthur Boak: "These municipalities were patterned closely after Rome, although certain titles, like those of consul and Senate, were reserved for the capital city… All officials were popularly elected" (A History of Rome to 565ad, 1965, p. 370). Dr. Boak goes on to write, "While the lower classes of Rome and the municipalities had little opportunity for political activity, they found compensation in the social life of their guilds or colleges… Thus arose professional, religious, and funerary colleges. Their organization was modeled on that of the municipalities" (pp. 370–371). Writing of the development of the incipient Roman Catholic Church, Dr. Boak adds, "In their organization these communities were all of the same general type, resembling the Roman religious collegia" (p. 401). In the congregations, increasing numbers of unconverted people wanted "say-so." They chose teachers who sanctioned elections, who pleased them with teachings that increasingly led them back into the pagan customs of the world around them. In his final letter to Timothy, the Apostle Paul had directly prophesied of this turn of events (2 Timothy 4:3–4). "But the episcopal chair was solicited, especially in the great and opulent cities of the empire, as a temporal rather than as a spiritual dignity. The interested views, the selfish and angry passions, the arts of perfidy and dissimulation, the secret corruption, the open and even bloody violence, which had formerly disgraced the freedom of election in the commonwealths of Greece and Rome, too often influenced the choice of the successors of the apostles" (p. 336). Using the institutions and practices of the Roman Empire as a model, men devised a church government structure. Political maneuvering became a substitute for seeking God's will. Popular and soothing teachings were substituted for the plain word of God, which offered correction and rebuke. The problem with the Church of Rome was that it substituted a human political structure in place of God's government. In God's government, elders are to be appointed, based upon their fruits, by those Christ has already set as leaders in His Church (Titus 1:5–9). God's government is based upon His law. God validates it based upon positive fruit being borne (Matthew 7:15–23; cf. Numbers 17:7–10). The Church of Rome developed on the model of the old Roman Empire from which it derived its structure. Idolatrous allegiance to the organizational structure was demanded, even if it sought to "change times and laws" (cf. Daniel 7:25). In God's government, He makes it plain where He is working by the fruits, and we submit to human leaders as long as they are following Christ (1 Corinthians 11:1). What of the mysterious number 666? Many ingenious solutions have been devised to label desired individuals with that number. But what does the Bible mean when it tells us that this is the number of a man? Before Arabic numerals became accepted in the western world in the 13th century, letters of the alphabet doubled as numerals. Thus all names had numeric value. Most of us are familiar with Roman numerals, where the letters of the Latin alphabet have numeric value. In this system I=1, V=5, X=10, and so on. Greek and Hebrew are the languages in which the Bible was written, and both use a similar system. The earliest proposed solution to the meaning of 666 is a tradition attributed to Polycarp, the disciple of the same Apostle John who wrote Revelation. This tradition is preserved in the second century writings of Irenaeus. The number 666 is "…contained in the Greek letters of Lateinos (L=30; A=1; T=300; E=5; I=10; N=50; O=70; S=200)" (Commentary on the Whole Bible, Jamieson, Fausset and Brown). Lateinos is a Greek term referring to the Romans. Interestingly, the Greek expression meaning "the Latin kingdom" (h Latine Basileia) also has a numeric value of 666. Greek writers commonly referred to the Roman Empire in this way. The book of Revelation was originally written in Greek, as it was written to Greek-speaking churches in ancient Asia Minor. Another interesting explanation involves the name of the emperor Nero, who died about 25 years before John wrote Revelation. Though Nero was dead, his rule was nevertheless a type of the end-time Roman system. He was brought to power promising constitutional reforms and a return to the "golden age" of Augustus, but became increasingly cruel and despotic after achieving power. Living in an atmosphere of intrigue and conspiracy, he abused his power and was responsible for the Roman state's first official persecution of Christians. During his reign most of the Apostles, including both Peter and Paul, were martyred. His name in Greek was spelled Neron Kaesar (Nero Caesar). When the Greek form of his name is spelled out in Hebrew characters, their numeric value also adds up to 666. The founder of ancient Rome was Romulus, from whose name Rome and Roman are derived. The Latin name Romvlvs is written in Hebrew as Romiith. In the Hebrew language this also adds up to 666 (resh=200, vau=6, mem=40, yod=10, yod=10, tau=400). Thus, in both Greek and Hebrew, the two languages of the Bible, the number 666 is stamped upon the kingdom that derived from Rome. The years ahead of us will bring the seventh and final resurrection of the Holy Roman Empire. There will most likely be special numeric significance to either the name, or perhaps a special title, of the end-time leader of the Beast power. However, it is important to realize that the Roman system is already stamped with 666. That system—and its end-time resurrection—is identified as the Beast. The tale of two dramatically contrasting cities is a thread that runs from beginning to end throughout the Bible. Genesis 10 introduces us to Babylon, or Babel, the city that Nimrod built. In Genesis 11, we meet Abraham, a man born in Ur of the Chaldees, an adjacent town and part of Babylon's ancient kingdom. Genesis 12 tells of Abraham's departure, at God's command, from the vicinity of Babylon. In Genesis 14, Abraham comes to Jerusalem, anciently called simply Salem, to meet with Melchizedek, "the priest of the Most High God," who both blessed Abraham and received his tithes. In the last book of the Bible, we read of Babylon once again. Revelation 18 speaks of "Babylon the Great" and of its final and total destruction. Just as was Abraham of old, God's end-time people are told, "Come out of her my people" (Revelation 18:4). Revelation 21 records the arrival on earth of the New Jerusalem, the city "whose maker and builder is God" (Revelation 21:2). Babylon and Jerusalem are two ancient cities, which represent two completely opposite systems of government and ways of life. One is derived from Nimrod, the first post-flood tyrant who rebelled against God and His laws. Nimrod introduced a system of human tyrannical government and sought to build a one-world government the devil's way. Babylon is Satan's historic counterfeit of, and alternative to, God's kingdom. After God's intervention at the Tower of Babel, Babylon's prominence rose and fell over the following centuries. Finally in the seventh century bc, the Assyrian capital Nineveh fell to invaders, and Babylon once again came to prominence as the chief city of Mesopotamia. Nebuchadnezzar became king of Babylon and launched an expansion drive that gave Babylon dominance over the entire Middle East. His conquests included Judah and its capital, Jerusalem. About 586bc, the invading Babylonians destroyed Jerusalem and the temple of God located there. Nearly 20 years before that, a number of young Jewish captives had been taken to Babylon. Among those captives was Daniel. On the evening that began the Feast of Trumpets in 539bc, 66 years after Nebuchadnezzar's kingdom had begun, Daniel stood in a hushed banquet hall and read "the handwriting on the wall" to one of Nebuchadnezzar's successors, Belshazzar. Babylon was weighed in the balance, found wanting, and would that very night give way to a successor kingdom. The city of Babylon fell, and after centuries became a desolate and uninhabited location, but the system that originated there did not end. It continued through its successors, just as Daniel recorded so many centuries ago. Genesis 10:10 explains that the beginning of Nimrod's kingdom was Babel. In the years just ahead of us, the end-time embodiment of that ancient kingdom is destined to once again rise. The ancient city built by Nimrod has long ago been reduced to dust and ruin, but the governmental, religious and economic system that began there has continued. Ancient Babylon has been succeeded by a modern Babylon, called by the prophet Isaiah the "daughter of Babylon" (Isaiah 47:1). We are living in a turbulent world. There is fear and apprehension about the future. On the one hand, science and technology promise a world of dazzling prosperity. Yet on the other hand, nuclear war and biological and chemical terrorism threaten the very existence of our world. A great charismatic leader in Europe will arise, responding to this crisis. He will enter into an alliance of church and state that will offer peace, security and prosperity to a desperate world. Using duplicity and intrigue, he will induce ten European leaders, representing the end-time successors to both the eastern and western parts of the Roman Empire, to unite temporarily and give their power to him as leader. As we saw in the 1930s, when people become genuinely frightened about their future, they are often willing to trade freedom for security. A period of growing peace and prosperity will ensue. A great worldwide trading combine will seem to offer incredible profits to international cartels. Later, responding to crises involving both the Middle East and the English-speaking nations, this leader will move with lightning speed and iron determination. Annulling a treaty previously made with the Jewish state, his armies will overwhelm Jerusalem and will take half of the city into captivity (Zechariah 14:2). At the same time, an attack of overwhelming force will be launched on America, Britain, Canada and related nations (for details of the prophecies relating to this event, write for our free booklet, The United States and Great Britain in Prophecy). The end-time manifestation of Babylon will promise what Nimrod promised the human family at the Tower of Babel: unity, security and prosperity. This is what Nebuchadnezzar, Cyrus the Great, Alexander the Great and Caesar Augustus, each in turn, also promised. The intensifying problems of global fracturing will be countered by a scheme designed to impose both political and religious unity on a worldwide scale. The coming European superpower may actually co-opt existing global institutions to use as a political structure for its own ends. Though important developments will occur in the political sphere, it is in the area of religion that we will see events unprecedented in modern times. Religion will be considered the key to bringing about the common identity required for political unity. By this time, millions all over the globe will have been caught up in a religious frenzy fed by a charismatic leader working what are apparently great signs and wonders. More concerned with "feeling good" than with true doctrines, they will respond to this leader's false promise that he is ushering in a golden age. A powerful war-making apparatus marshaled by the coming European superpower will be billed as the cornerstone of world peace and security. Modern technology will be used to create a police-state that Hitler and Stalin could only have dreamed about. People will be induced to accept such draconian measures as the price of getting rid of terrorism and violent crime. At first, this system will bring an upsurge in the world economy. A worldwide trading combine, prophesied in Ezekiel 27 and Revelation 18, will be hailed as the key to universal prosperity. Those at the helm of this system will, for a short time, enjoy unparalleled wealth. Yet fatal flaws in this system, inherent from its beginning, will in time produce widening disparities. The Arab world will be displeased by attempts to coerce it into religious unity with Europe. A powerful leader—called in Daniel 11 the "king of the South"—will then arise, able to bring about temporary unity of much of the Islamic world. Provoked by this leader, Europe will launch a "blitzkrieg" resulting in European occupation of much of the Arab world (Daniel 11:40–43). This European occupation will deepen suspicion among the eastern nations—already wary of the German-led Europeans. Rumors from the eastern capitals will ultimately cause the Europeans to launch what is intended as a preemptive attack to intimidate the East into submission (Daniel 11:44). Things will not go as well as planned, and the resulting warfare will ultimately cause the nuclear destruction of much of Europe, including Rome itself (Revelation 18:10, 17), by the alliance of eastern powers (Revelation 9:13–18). As eastern armies cross the Euphrates River to launch an invasion of the European-controlled Middle East, events will spin totally out of control. The ten European rulers who gave power to launch this system will bitterly turn on the church and religious system which failed them (Revelation 17:16–17). Horrifying weapons of mass destruction, including nuclear weapons as well as biological and chemical weapons (Revelation 9:5–6, 18), will be unleashed. Just when it appears that humanity will destroy itself as a result of the confrontation in the Middle East, the living, glorified Christ will return from heaven (Matthew 24:22). In the context of this most hellish period in the history of mankind's violent and bloody existence, the real solution to humanity's problems will be inaugurated. Jesus Christ's return to this earth is not a fantasy—it is mankind's only hope. Transported in vision into that future Day of the Lord, John recorded a marvelous event yet ahead of us, "Babylon the great is fallen, is fallen" (Revelation 18:2). In the aftermath of that event, Jesus Christ will stand on the Mount of Olives near Jerusalem with all of the resurrected saints. The God of heaven will set up a kingdom that shall never be removed (Daniel 2:44). The law will go forth from Jerusalem, and all nations will be brought under the government of God (Isaiah 2:2–3). The Bible records a tale of two cities, Babylon and Jerusalem. One will be destroyed forever. The other will be created anew as the New Jerusalem which will come down from heaven after the 1,000-year reign of the Messiah, providing the dwelling place for the Father, for Christ and for the "firstfruits" for all eternity (Revelation 21). The end-time events described in this booklet are real—and will occur within the lifetime of many reading it. Yet Christ offers protection to those who are truly, zealously walking with Him and doing His Work (Luke 21:36; Revelation 3:10). What about you? Does your "citizenship"—your loyalty and allegiance—reside in Babylon below or in Jerusalem above? Your future depends upon your answer to that question! "Seek the Lord while He may be found, call upon Him while He is near" (Isaiah 55:6). The God of heaven will soon set up an enduring kingdom. He now offers us not only His protection and help in the terrible times ahead, but also an entrance into His glorious kingdom and an inheritance that will last forever! As you watch the world around you increasingly unravel in the years ahead, do not become discouraged. Rather, Jesus Christ exhorts His true followers, "Now when these things begin to happen, look up and lift up your heads, because your redemption draws near" (Luke 21:28). In spite of calamities on the horizon, always remember that the best news lies yet ahead! "For yet a little while, and he that shall come will come, and will not tarry" (Hebrews 10:37, KJV).